"Highlights : Govt of AP GPF, Pension, Final withdrawal Online Application form | Check status of pension application agap.cag.gov.in Apply Andhra Pradesh Govt Retried Employees Pension online | Check AP Pensioners Pension GPF Final withdraw online | AP Govt pensioners information agap.cag.gov.in | AP Pensioners pension forms download online | andhra pradesh pension website"
Account General Office, Government of Andhra Pradesh has introduced Online Application Process for Apply Andhra Pradesh Govt Retired employees, Pension,GPF ( General Provident Fund ), Final Withdraws online. AG AP Provide this facility their Owen official website http://www.agap.cag.gov.in/, Every Govt Employee after Retirement apply their pension online through Principal Account General (A&E) Andhra Pradesh Offical Web portal. Pensioner no need to go to Sub Treasury office or Pension office. In earlier years this process will be take long time, Now it is very easy for apply Pension, GPF, online. After process will be completed, Pension Amount will be credited in to Beneficiaries register Bank account directly. 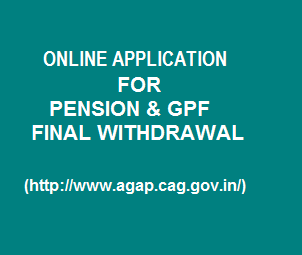 Process of online Application for apply Pension, GPF,Final withdraws through Web Portal. 1.To help the retiring/ retired Government Servant/ Family Pension Beneficiaries to generate pension proposals and GPF final Withdrawal application by filling the data online. 2.As soon as the government Servant fills data through online facility,AG will review the status of GPF and Loan accounts of the Government Servant and will Communicate the wanting information,if any,to the pension sanctioning Authority. 3.Applicant can take print out of the application in desired number of sets, sign at appropriate places and can submit to the pension sanctioning (PSA) for approval. PSA in turn would fill up his portion of the application online and would take a print out, Which he would forward along the service Books to AG After signing at appropriate places. 4. By the time the Pension application with service book and GPF application reaches to PAG, information pertains to the applicant will be kept ready and necessary authorisation/Clarence certificates will be issued without delay. 5. Once authorised,party copies of pension and GPF would be placed on the website and the same can downloaded by the applicant. Who Can fill AG AP online Pension Application form ? All Retiring Government Servants whose pension is to be authorised by the Principal Account General (A&E), AP, Hyderabad and/or whose General Provident Fund account is maintained by PAG (A&E). How to apply AP govt Retired Employees (Pensioners) Pension online ? Andhra Pradesh Government Retiring/Retired Employees apply their Pension, GPF, Final withdraws through Principal Account General official Web portal. Just log on to www.agap.cag.gov.in. following below instruction for apply Pension online, GPF, Final withdrawal online. Before Staring the process keep the following requirement to access the online form. In case of service Pension. Date of death in case death of Government Servant accurs after the date of retirement but before drawing the service Pension. 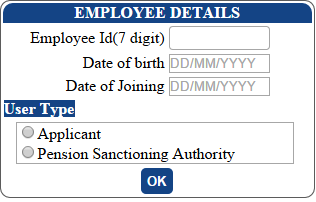 Name of Family pension beneficiary,his/her date of birth and relationship with Government servant. Name of family members as per Service Book, their age,relationship with him/her,their marital status and employment status. Whether retiring Government Servant is willing to commute pension,if so the percentage of commutation not exceeding 40%. Designation and address of the Drawing Disbursing Officer/Pension Sanctioning Authority. General Provident Number has been allotted PAG (A&E) or state Audit Department. Office worked during the last 3 years prior to the date of retirement of retiring Government Servant - Name of the office, address, from date and to date and designation. names of Nominees and Alternative Nominees of retiring Government Servant,their age,relationship,percentage of share,their address and contingency on which nomination becomes invalid. GPF Account Number with Suffix allotted by AG. Joint photograph of retiring Government Servant with FP beneficiary/Guardian with minor or handicapped child in digital format . Name of applicant and his/her relationship with the Government Servant.